There are sixteen standard functions on the main screen, which can be divided into three sections. The yellow functions represent the stats raising functions, and are accessible all the time (weekday and weekend). Clicking on a yellow function on a weekday will make you do the specified activity until the weekend, unless there is a public holiday. Clicking on it during a Sunday will make you do it for the whole day, but your parameters increase faster compared to an entire week's increase. The orange functions are only available during weekends or holidays (including public). clicking on an orange function will make you do the activity for the entire Sunday (yes, even phoning). The green functions are functions that will not affect the passage of time (i.e. you won't lose a day checking the net compared to visiting Tsukushi) and can be accessed at any time, weekday or weekend. For various events there are also five other special functions which will replace one or all of the yellow functions. Click on the words for more information. - 'Stat/statistic' and 'parameter' are used interchangeably, though 'parameter' is considered the official word. - All yellow functions excluding 'sleep' raise your stress. This function lets you sleep. It lowers your stress, but it lowers everything else, too. It is recommended to only sleep during weekends, because then only one other parameter will be lowered, compared to weekdays when almost all will suffer. This function lets you study. It raises your intelligence, some art and a little fashion, but lowers your sports and a little charm. This function lets you paint pictures of cats and flowers. It raises your art, some fashion and a little intelligence, but lowers a little sports and social. This function is multi-option and lets you join/quit a club and practise your club's activity. When you first start playing a game it is only accesible in weekends during the school term, and clicking on it will reveal a list of clubs you can join. Once you have joined a club the function will now show a symbol of the club you chose. Clicking on the club function will enable you to practise your club's activity or attend meetings (and competitions), while the option that appears beside it (with the original picture when you were in no club) allows you to quit. The parameters influenced depends on the club you chose. This function lets you run. It raises your sports and some social, but lowers some charm and a little of intelligence and art. This function lets you read magazines. It raises your fashion, some charm and a little art, but lowers a little intelligence and social. This function lets you stare at yourself in the mirror. It raises your charm, some fashion and a little art, but lowers some social, a little intelligence and sports. This function is multi-option and lets you play with your girl friends. The maximum number of sub-functions is four and the minimum one, depending on how many girls you have already met. The parameters influenced depends on the girl you play with, though all raise mainly social. The default order of sub-functions is as listed below, though they change depending on who you last played with. This sub-function lets you study with Arisawa. It raises your social, some intelligence and a little art, but lowers some sports. This sub-function lets you play badminton with Konno. It raises your social and some sports, but lowers very little fashion, intelligence and art. This sub-function lets you chat with Natsumi. It raises your social and some fashion, but lowers a little art. This sub-function lets you play dress-up with Sudou. It raises your social, some art and a little charm, but lowers some intelligence. This function lets you phone a guy for a date or join/quit a part-time job. Clicking on the function brings up another box with two columns. The one on the left is a list of guys' phone numbers you have, while the one on the right is a list of part-time jobs you can apply for. This function usually lets you go out shopping alone, so you can buy clothes and accessories. However, if you have a date or study date on the day the function will change to reflect a heart (instead of the usual stick figure), and clicking on the function will let you go for your date. If going for a date, clicking on the function will first bring you to the Clothes function for you to select clothes and accessories for the date. This function lets you visit your younger brother Tsukushi, where you can find out your social status (how the characters feel towards you), information on the guys in the school (including their phone numbers) and advice on good dating spots. More information on this can be found here. This function is multi-option, and rolling your mouse over will scroll out two more functions at the side. These functions are listed in order, from left to right, below. This function will open the same box as the options which can be chosen in the Game Start menu. More information on this function can be found here. This function opens a box in which you can save and load your current or previous games. The top row, from left to right, gives you the choices 'save', 'load', 'copy' and 'clear' You can save fifteen games in one memory card and if you have a second memory you can save another fifteen. 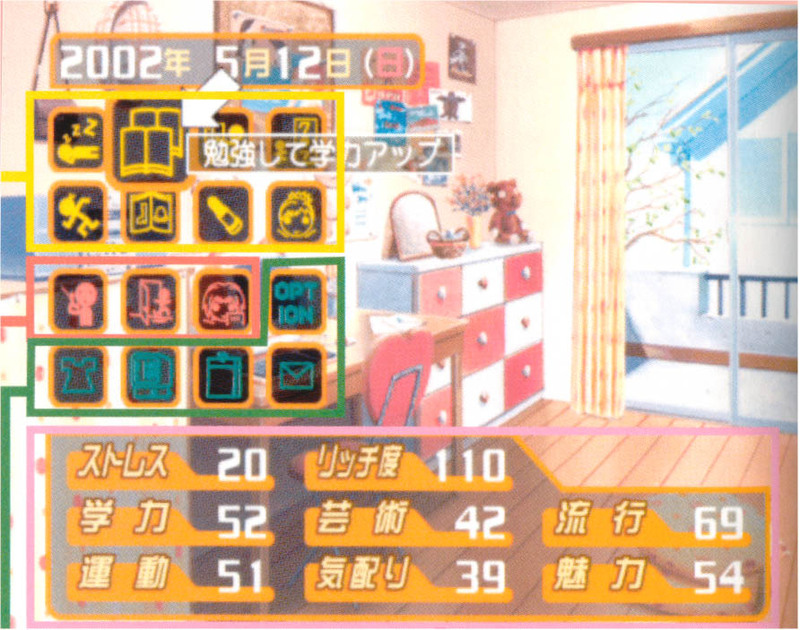 The lower portion of the box lists the information of the current game (e.g. your club), and the character you're closest with (including girls) will appear in an SD picture with you doing their favourite thing (e.g. Kazuma with a basketball). This function lets you adjust the intonation in which the characters call your name so that it sounds more natural. You can also change your EVS name and EH WHAT ELSE CAN YOU DO MELI? This function lets you change your clothes and accessories. You can also save combinations of clothes for you to change more easily in the future. This function will automatically be opened when you go out for a date (click on the shop function while it has a heart). This function, actually defined as your personal computer, lets you surf the Habataki Net. It is very important in your game life, so check it at least once every month. The Habataki Net consists of four sections, each of which are expounded on below, in the order they appear on the net. Take it from us, this is the most important part of the net. It has all the latest news relevant to your game life, including new date spots, events and shops. Also, for some new date spots (e.g. bungee jumping), you must click on the link in order to unlock it. So click on all links! The news is updated every month. This is the schedule and synopsis of all entertainment in Habataki City which changes, meaning movies, theater and the event hall. This is useful if you're planning to bring your date to one of these three date spots (please, don't drag Madoka to the symphony orchestra). The schedule is updated every three months. The Tokimeki Horoscope! No, this is not superstitious flak. Maybe in the real world, but in the game world it actually influences your progress! There are predictions for four aspects of your life, 'study', 'leisure', 'health' and 'love'. For the first three, the prediction will influence your stats (e.g. a smiley face for 'study' means your intelligence rises faster), whereas for 'love' it influences the likelihood of a guy accepting your date. The prediction is over four weeks (one month), one prediction for each week. The horoscope is updated every month. Just because it has Goro's name on it doesn't mean you should take it lightly. This is because Goro's column is for discussing the 'in' thing, and be quite useful in dating guys like Madoka (hey, even Kei compliments your being fashionable). If you don't want to read the entire thing, just note the phrases in colour. There will be three in all. The first is on the type of clothing that is fashionable, the second is the 'in' colour and the last the accessory. Goro's column is updated every month. This function will bring up another box showing your schedule for this month and the next. Scroll over any icon to see what is the event for that day. Note that if one of more events happen on the same day, only one icon will be shown, so be careful of that (especially if there might be club meetings). This function lets you read your mail, though you can't delete or do anything else to them. When you have new mail, the word 'NEW' will be seen on the email function. There are only four kinds of mail you will receive. One, the one you will receive most often (if you're sociable), is from your girl friends. You will also receive mail every month notifying you of updates to Habataki news, as well as email notifying you that you may apply for a part-time job, which you will receive once you meet their requirements (e.g. the first job offer comes when your social is above 50). The last kind of email you will receive is from Chiharu, the hidden character of Tokimeki, and is the only kind you can reply to. There are five other functions which will appear during certain events, which can be classified into two types. One is the function which cannot be skipped, as it happens on a weekday (orange functions unavailable) and all yellow functions are replaced by this function. Simply click any function to attend. The other is a function which can be skipped, as it only replaces one yellow function. These functions are described, in no particular order, below. This function cannot be skipped, and occurs the most often out of all the special functions, as there is a test at the end of every term (three tests per year). Click any of the test functions to begin your term test. It influences none of your parameters. This function cannot be skipped, and occurs every year during august if you are in a club. Click any of the summer camp functions to begin your two week camp practising your club's activity. The parameters it influences depends on your club. This function is the only one of all the special functions which can be skipped. It replaces the club function exactly two weeks before the Culture Festival and is for you to prepare your club's showing at the culture Festival. Even without a club the function will still appear. It influences a little of all your parameters. This function cannot be skipped, and will occur only once in the game, during September of your second year. Click any of the school trip functions to begin your week long trip to Kyoto and Nara. It influences none of your parameters. This function cannot be skipped, but it only happens when you fail three or more of your term test subjects. Click on any of the remedial functions to attend remedial with Himuro-sensei for a week. It raises intelligence.